​The Erinyes are three minor goddesses of the Greek pantheon, who appear in tales of Greek mythology, as avenging spirits, punishing those who have undertaken crimes against the natural order, and in particular crimes of children against their parents. ​The Erinyes were early goddesses predating the time of Zeus and the other Olympians. The Erinyes were born as the result of a crime; hence their close association with familial crimes, for the three sisters were born when the blood of Ouranos fell onto Gaia, after Ouranos had been castrated by his own son Cronus. The time and manner of the birth of the Erinyes makes them siblings to the Gigantes, the Meliai and Aphrodite. A less common parentage for the Erinyes, is given, by some writers, as Nyx, the Greek goddess of the Night; Nyx being mother to many of the “dark” deities of Greek mythology. Today, it is common to suggest that there were three Erinyes, named Alecto, unceasing, Megaera, the grudging, and Tisiphone, the avenger; though names and numbers are taken from the work of Virgil, with many other writers, not giving names or numbers of Erinyes. There is a possibility that people believed if people spoke of the Erinyes, then the attention of the goddesses might be drawn towards them. Virgil was of course a writer from the Roman period of antiquity, and in Roman mythology the Erinyes were known as the Furies, a name which is today more recognisable than that of the Erinyes. ​The Erinyes were considered to be monstrous crones, sinister women dressed in black with distinctive features. These features, depending upon author, could include large wings, and bodies around which poisonous snakes circled. The Erinyes would also be in possession of tools of torment and torture, with whips common accompaniments. ​The Erinyes were goddesses of Retribution, bringing to justice those who undertook crimes against the natural order of the cosmos. 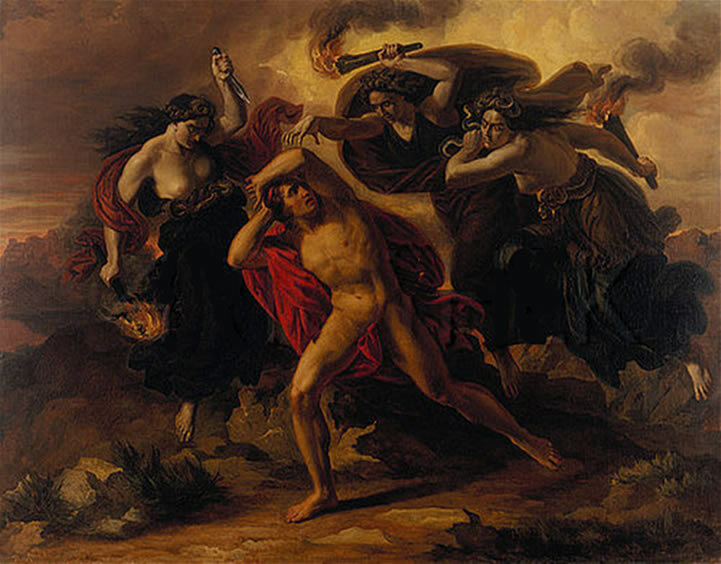 As a result, the Erinyes are commonly associated with bring vengeance upon those who have committed crimes against family members, be it matricide, patricide, filicide or fratricide; and again, because of the manner of their birth, the Erinyes were commonly brought forth when crimes were committed against parents. Additionally, the Erinyes were called upon when oaths were broken, or when the deities of the Greek pantheon were insulted. The Erinyes were considered to be residents of the Underworld, and this also gave them an additional role in Greek mythology, with the Erinyes cleansing sins of those decreed worthy by the Three Judges of the Underworld, but also taking those individuals to Tartarus, who were condemned to be punished. In Tartarus, the Erinyes would become both the prison guards and the torturers of residents. ​When the Erinyes were called upon to leave the Underworld and enter the realm of man, the vengeance brought upon individuals often took the form of madness or illness; with the Erinyes pursuing that individual without rest. . But the Erinyes could also punish the whole population by bringing forth famine and disease, as was the case with the land of Thebes following the crimes of Oedipus. It was though also possible in rare cases to placate the Erinyes, for Heracles, having killed his wife and children, was cleansed of his crime, but then had to undertake additional penance, penance which took the form of servitude to King Eurystheus. ​The best known tale in Greek mythology about the Erinyes, is the tale of Orestes encounter with the goddesses of Retribution, a tale told in detail in the Oresteia by Aeschylus. Orestes was the son of King Agamemnon of Mycenae, and his wife Clytemnestra. With Agamemnon absent during the Trojan War, Clytemnestra took herself a lover, in the form of Aegisthus, and upon Agamemnon’s return from Troy, Clytemnestra and Aegisthus killed the Mycenaean king. Several years later, Orestes gains vengeance for the death of his father, possibly upon the instruction of Apollo, and Orestes kills his mother and Aegisthus. The deceased Clytemnestra calls upon the Erinyes to avenge her, and bring retribution upon her son. The Erinyes depart from the Underworld, and pursue, and torment, Orestes, as he travels from Delphi to Athens, for Orestes now requires the assistance of the goddess Athena. Athena tells Orestes to request a trial for his crime, and to decide whether the murder of a father, or of a mother, was the greater crime. In the trial, the Erinyes were the prosecution, whilst Apollo acted for the defence, whilst the jury was made up of Athenians. A hung jury was decided with the casting vote of Athena, and Orestes is acquitted. ​The Erinyes though now threatened to bring famine upon Athens, but Athena placates the other goddesses, and from then on, the Erinyes were worshipped by the citizens of Athens. Alongside this bribe, Athena also threatens the Erinyes with violence unless they agreed.